There is nothing more attractive than a confident woman or man. Think about someone you know who radiates confidence, and most likely, that person is successful and well-liked. Unfortunately, as we age, our confidence may begin to fade, along with our looks. We catch a reflection of ourselves in a mirror and see sagging cheeks and drooping that wasn’t there in the bloom of youth. A face that once boasted high cheekbones is now beset with Bassett hound-like jowls. If this description resonates with you, don’t despair. There are ways to restore your confidence and rid yourself of drooping cheeks – both surgically and non-surgically. Skin tightening procedures can be broken down into three categories: Surgical, Nonsurgical, and Minimally Invasive. The granddaddy of facial rejuvenation, this surgical procedure raises sagging skin and support tissues. In those cases in which the skin has extensive loss of elasticity, the facelift is by far the most effective way to safely remove extra skin. For patients with milder skin elasticity issues, a mini-facelift can be conducted in place of a full facelift. Your surgeon will use smaller incisions to lift muscle and tissue, remove excess fat, and raise or trim excess skin. 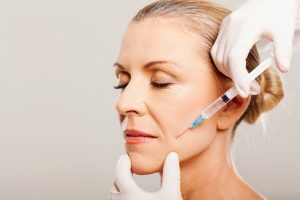 The outcome of the mini-facial is less dramatic than that of a full facelift, but for some people, it may be the perfect solution to tighten up cheeks. This procedure uses ultrasound technology to lessen the effects of time and gravity on your skin. In addition to being noninvasive, it acts to stimulate collagen production, gradually lifts skin at your body’s own pace, and also works to smooth lines and wrinkles on your brow, neck, and décolletage. You may notice a difference right away, however, most results take approximately three to nine months. Somewhere between surgical and nonsurgical treatments are minimally-invasive treatments. They are typically performed under local anesthesia and have shorter recovery times compared to surgery. These treatments are typically less effective than surgery, but more effective than nonsurgical treatments. There are several minimally-invasive medical devices that apply thermal energy under the skin to achieve a limited degree of skin tightening. The best-known device, called ThermiTight, uses radiofrequency (“RF”) energy to stimulate collagen production to smooth and tighten sagging skin. A tiny probe is used to apply thermal energy to tissues under the skin. The tissue and skin temperature are continuously monitored for safety. This procedure is usually quick and easy, with patients experiencing little-to-no downtime. For some patients, simply tightening the skin won’t completely recapture that youthful complexion. Lost volume in the cheeks magnifies the effects of aging. The following treatments are some of the most popular options. Fillers such as Restylane or Juvederm are an ideal, nonsurgical solution for lost facial volume and loose facial skin. Fillers also aim to smooth both deep facial wrinkles and less prominent lines. Your skin’s elasticity, and the natural contours of your face, are major factors in individual results. In some instances, a surgical fat transfer is a solution to hollowed cheeks. Your surgeon would remove very small amounts of fat from other areas of the body (usually the stomach or thighs) and transfer the fat to the cheeks to plump them up. Lastly, for some individuals, implants are the best solution for longer-lasting, more dramatic results. Your surgeon will recommend this treatment if you are a good candidate. Dr. Thomas W. Loeb performs all of these procedures and more at his private Manhattan surgical suite located on Fifth Avenue. If you are interested in having skin rejuvenation in New York City and want to learn more about the anti-aging skin care treatments practiced by Dr. Loeb, we invite you to call 212-327-3700 or email us to schedule a private consultation.